2014 BMA Medical Book Awards Highly Commended in Oncology category! 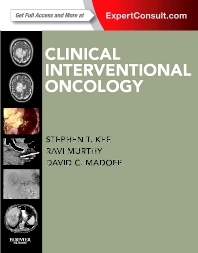 Adhere to best practices and achieve best outcomes with Clinical Interventional Oncology! Loosely structured around the concept of a "tumor board," this groundbreaking oncology reference delivers a comprehensive arsenal of information on the techniques and treatment protocols surrounding chemoembolizations, tumor ablations, minimally invasive tumor biopsies, and other interventional oncologic procedures. Ideal for all members of the cancer care team, it provides the "how to" guidance you need on the clinical, evidence-based application of each interventional procedure. Offer your patients the best care. Evidence-based findings and practical tips equip you with the knowledge you need to recommend and implement the most effective cancer treatment options with your patients. Master all image-guided interventional oncologic procedures currently in practice for the interventional treatment of tumors and lesions in liver, lung, renal, pancreatic, brain, neck, colorectal, skin, prostate, bone, and soft tissue cancers. Broaden your understanding and refine your skills with comprehensive coverage of stents, venous and arterial ports, and interventional procedures for palliative care. Quickly and easily find the information you need. A templated, easy-to-reference format organized by organ system includes anatomy, biology, imaging principles, and procedures integrated throughout each chapter. Experience clinical oncology scenarios with vivid clarity through a full-color design complete with an abundance of high-quality anatomic and multimodality images. Access the fully searchable text and over 800 images online with Expert Consult.